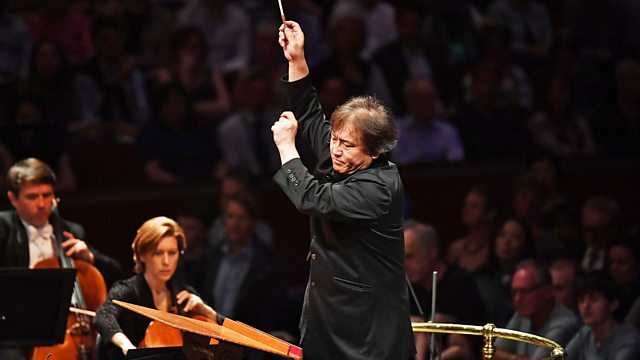 Live from the Royal Albert Hall, BBC Symphony Orchestra performs Ravel's Piano Concerto, plus Mark-Anthony Turnage's Hibiki. After: Live at BBC Proms: BBC Symphony Orchestra conducted by Kazushi Ono - Ravel's Piano Concerto, with soloist Inon Barnatan, and the European premiere of Mark-Anthony Turnage's Hibiki. Sunlight and sensitivity dominate Debussy's ravishing Prélude à l'après-midi d'un faune. The cooler shades of jazz shoot through Ravel's Piano Concerto in G major. Mark-Anthony Turnage's Hibiki (Japanese for "beautiful sound") makes reference to the earthquake and devastating tsunami which struck north-east Japan in 2011. A children's chorus and settings of Japanese poetry for soprano and mezzo-soprano soloists create a sequence of threnodies offering solace after loss. This is the European premiere. Orchestra: BBC Symphony Orchestra. Conductor: Kazushi Ono. Performer: Inon Barnatan. Orchestra: BBC Symphony Orchestra. Conductor: Kazushi Ono. Mark-Anthony Turnage in conversation with Kate Molleson. Performer: Sally Matthews. Performer: Mihoko Fujimura. Choir: Finchley Childrens Music Group. Choir: New London Children's Choir. Orchestra: BBC Symphony Orchestra. Conductor: Kazushi Ono. Performer: Shalan Alhamwy. Performer: Benyamin Nuss. Lyricist: Nesrine Khoury. Singer: Rasha Rizk. Performer: Jan Lisiecki. Orchestra: Accademia Nazionale di Santa Cecilia Rome Orchestra. Conductor: Sir Antonio Pappano. Jan Lisiecki I Antonio Pappano: Schumann.